Next week, President Barack Obama will be the “chief guest” at India’s Republic Day, the annual celebration of the 1950 Indian Constitution. The visit is expected to usher in a new, positive era in India-U.S. relations at a time when a majority of Indians have a favorable view of the United States and a majority of Americans express a positive opinion of India. Nearly half of Indians also voice confidence in Obama doing the right thing in world affairs, and by more than three-to-one Indians say the United States, not China, is the world’s leading economic power. Nevertheless, America’s image and Obama’s stature is not as well-known in India and therefore lags behind overall ratings compared with many other countries. 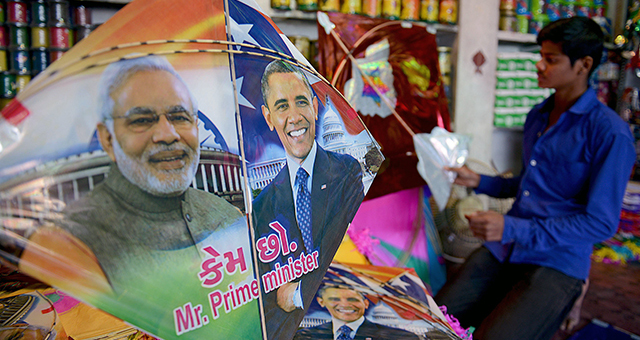 So Obama’s foray into public diplomacy on the Asian subcontinent could not be more timely. The Indians’ favorable view of the U.S. is similar to the opinion of America voiced by the Germans (51%) and the Chinese (50%) and certainly more favorable than that held by the Russians (23%) and Pakistanis (14%). But it trails the median view of the U.S. in the European Union (66%) and in other major emerging market economies: Brazil, South Africa and Indonesia. Moreover, nearly three-in-ten Indians voice no opinion about the United States — so the president has some salesmanship ahead. Indians are generally positive about Obama himself; 48% have confidence in his handling of foreign policy. But such Indian approval of the U.S. president is lower than that expressed in Bangladesh (74%), Indonesia (60%) and in the European Union (where the median is 71%). And it is no higher than Chinese (51%) confidence in the U.S. president. However, again the proportion of Indians who have no opinion is quite high: 37%, suggesting a successful visit could raise the president’s profile across India. Indians have no doubt, however, about which country is the world’s leading economic power. Fully 47% say it is the United States, just 13% pick China and 7% Japan. Again, nearly a third (31%) have no opinion.